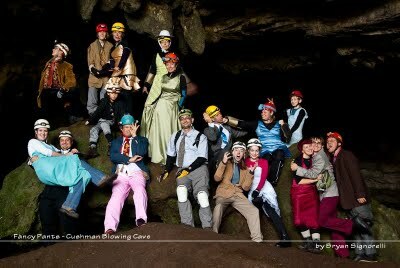 Today was the 5th annual Fancy Pants trip, hosted by the Little Rock Grotto and organized by Aly and I. We had ~22 people attend this year and some folks broughthors d'oeuvre and sparkling grape juice to snack on during the pre-caving photo session. We split into three groups and headed in for a four hour trip to the waterfall and back. Everyone, first-timers especially, had a great time and enjoyed the silliness of the occasion. Below is a slideshow of the other photos from Fancy Pants 5. Click here to see it full screen.